Bangladeshi farmer Jorina Katun stands among the Rohingya Muslims camped out on her land near the Kutapalong refugee camp in the Cox's Bazar district of Bangladesh, Feb. 9, 2018. The first Rohingya refugees who arrived on Jorina Katun’s farmland in Bangladesh last year were worn out and traumatized after fleeing violence in neighboring Myanmar. They wept and begged to stay, and Katun, moved by their plight, said yes. “I really regret that,” she said. “They said they would stay for only a month. They’re still here and more are coming.” Katun now has 25 Rohingya families living on a patch of land where she used to grow rice and vegetables. Since August, nearly 700,000 Rohingya have crossed from Myanmar’s Rakhine State into Bangladesh. Makeshift camps housing the Rohingya sprawl across thousands of acres of what was once a government forest reserve, butting up against, and sometimes overwhelming, Bangladeshi homes and land. Jorina Katun lives on the edge of the largest such camp. Officials and aid workers fear that the welcome is wearing thin, because of the unprecedented number of refugees and growing doubts over whether Myanmar will ever take them back. Repatriation was to begin in January under an agreement signed by Myanmar and Bangladesh. But the plan has stalled because of safety and logistical concerns, and meanwhile Rohingya continue to flee across the border. Rohingya Muslims gather outside their makeshift homes on land belonging to Bangladeshi farmer Jorina Katun near Kutapalong refugee camp in the Cox's Bazar district of Bangladesh, Feb. 9, 2018. So far, local people have been remarkably tolerant, with many feeling duty-bound to help fellow Muslims they see as being oppressed because of their religion. There have only been a handful of anti-Rohingya protest, all small and peaceful. But many also blame the Rohingya for driving up food prices and stealing jobs, and officials worry that the refugees bring with them an increased risk of disease, militant activity and drug trafficking. Residents have been told to report any Rohingya seen outside the camps, Rahman said. “It’s for our security, so they can’t get up to any terrorist activity,” he said. Rohingya refugees stand in a queue to collect aid supplies in Kutupalong refugee camp in Cox's Bazar, Bangladesh, Jan. 21, 2018. Before the current crisis, Bangladesh was already home to 300,000 Rohingya refugees who had fled previous bouts of violence in Myanmar. Now, in Ukhia and Teknaf, two sub-districts near the Myanmar border, Rohingya outnumber local people by about two to one. Residents of Ukhia and Teknaf were already among Bangladesh’s poorest and by some measures as deprived as the refugees, according to ACAPS, a Geneva-based think-tank that analyzes humanitarian responses. Seven in 10 families, both Bangladeshi and Rohingya, struggled to get enough to eat, ACAPS found. Little of the land around Cox’s Bazar is suitable for farming, so Bangladeshis have to buy about 80 percent of their food in local markets, said ACAPS. The price of that food is rising, said Hamidul Hoque Chowdhury, a college principal who heads the Ukhia branch of the Awami League, the party of Prime Minister Sheikh Hasina. Six months ago, 1 kg of potatoes cost 20 taka ($0.24); it has since tripled in price to 60 or 70 taka. The price of fish has doubled, he said. 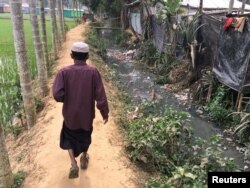 Chowdhury, who helped organize a small anti-Rohingya protest in Ukhia in January, said Rohingya were competing with Bangladeshis for unskilled labor jobs, the main source of income for about half the local population. Faruk Ahmed, 73, a local farmer, said he hired Rohingya laborers because they were cheap, plentiful and hard-working. 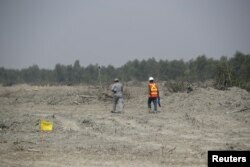 Construction workers walk along the island of Bhasan Char in the Bay of Bengal, Bangladesh, Feb. 14, 2018. Partly to ease the congestion at the camps, Bangladesh is accelerating a controversial plan to temporarily relocate 100,000 Rohingya on a remote island in the Bay of Bengal. H.T. Imam, an adviser of Prime Minister Sheikh Hasina, said the refugees must be kept apart from Bangladeshis. “In the past the Rohingya spread out and caused serious law and order problems,” he said. Humanitarian groups said they were also looking for ways to support the Bangladeshi community. Of the $950 million budget currently being requested from donors for March to December, a quarter had been earmarked for projects that will directly benefit Bangladeshis, said U.N. host community liaison Maurice Dewulf. There are “no major signals yet” of problems between Bangladeshis and locals in Cox’s Bazar, Dewulf said, but such problems become more likely the longer a refugee crisis lasts. A man walks between a rice field and the shacks of Rohingya refugees living on the land of Bangladeshi farmer Jorina Katun near the Kutapalong refugee camp in the Cox's Bazar district of Bangladesh, Feb. 9, 2018. The Rohingya families camped out on Jorina Katun’s land are also doing what they can to keep the peace, paying Katun between 300 and 600 taka ($3.50 to $7) a month in rent, says refugee Bodi Alam. The Bangladesh Army, which oversees security in the area, said it forbids local people to charge rent. “But we still pay,” Alam said. Without such payments, there would be quarrels with the Bangladeshis. “They will say ‘go from here, this is our area, these are our houses, this is our land,’“ he said.